eContracts is a master solution for all your contract management needs. It has features for all aspects of contract management including contract creation, negotiation, lifecycle management, governance, security and performance management. Users from diverse areas of business can collaborate on contracts, perform duties proactively, prioritize tasks and mitigate risks at every level. eContracts supports all contract management scenarios and use cases to help your teams turn business deals into success stories. Secure, reliable repository in the cloud or on-premise for all contract related information. Organize all documents, metadata, amendments, correspondence and notes for each contract in single contract record. Capture and analyze data from text in contract documents using discovery and OCR tools. Categorization based on nature of contractual transaction, data and administrative needs. Find contract records, documents or counterparties using any metadata. Create quick views with frequent search criteria. Set up and manage renewals, expiration and close out processes for contracts with auto renewals, reminders and approval processes. Support contract amendment process with approvals, document automation and comprehensive audit trails. Use pre-approved templates to quickly draft contract documents. Route documents through pre-configured or ad hoc workflows to contract reviewers in a serial or parallel fashion. Instantly add standard terms and clause language to contract documents from clause library using the Word add-in. 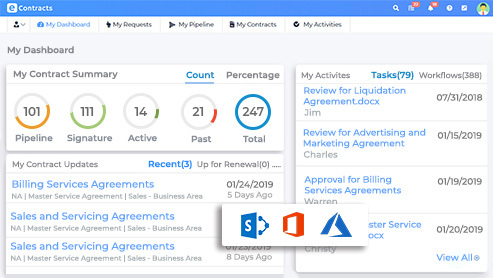 Business area dashboards, provide administrators and business owners, a quick overview on contract activity within their department, team or location. Associate each contract with one or more counterparties from eContracts counterparty database to use counterparty level reporting and management features. Ensure compliance for each contracting entity in your company by setting up specific procedures and preferences. User configurable, personalized alerts and reminders delivered on the user dashboards and inboxes. Define and set up governance areas for each business unit to administer templates, permissions, workflow rules, and user access. Tag contracts with specific clauses and terms as you create or upload documents to support legal search, analysis and reporting. Capture expected revenue and spend of a contract with features for currency conversion and calculations for lifetime value, annual value. Add users to eContracts from Active Directory or SharePoint groups, and manage access for the overall system, specific repositories or individual contracts. Users get a quick view of most important contract tasks from a single interface. Support business issues and legal requests with features like prioritization, team level task auto- assignment, escalation and delegation. Supports business users submission of requests for new contracts, amendments templates and 3rd party contract review. Analyze contract process bottlenecks by tracking time spent on each approval or review task or stage using our contract cycle-time reports. Try us. You will love the eContracts experience. © Copyright 2019 Optimus BT, Inc.